An English author who originally hailed from the west of England (possibly Wales), William Baldwin wrote and published a number of works in the mid-1500s while living in London and has been credited, thanks to his satirical work, Beware the Cat, as being the author of the first English novel. 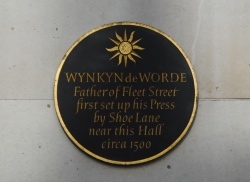 Baldwin is believed to have studied at Oxford prior to coming to London where, from 1547, he worked with the printer Edward Whitchurch – who had apparently set up shop at Wynkyn de Worde’s former printworks at the Sign of the Sun (now at the Stationer’s Hall, just off Ludgate Hill – pictured) – as a corrector. Whitchurch also published Baldwin’s works including the popular Treatise of Moral Philosophy (1547) and Canticles or Balades of Salomon (1549), which was dedicated to a young King Edward VI and was a translation of the Biblical book, Song of Songs. His other works included being the editor and key contributor to the hugely popular and influential Mirror for Magistrates (1554) which was something of a cautionary tale for public officials, and the Marvelous History Entitled Beware the Cat, Concerning Diverse Wonderful and Incredible Matters (aka Beware the Cat). The latter book, which is an attack on Catholicism, tells the story of a priest who uses alchemy to talk to cats and finds that, despite his low opinion of them, they actually live according to strict rules (reflecting on the arbitrary nature of the “rules” which govern everyday life). While Baldwin is believed to have finished the work during the last months of the reign of King Edward VI (he died on 6th July, 1553), the subsequent accession of Queen Mary I and her tougher line on the press freedoms led Baldwin to postpone publication until 1561 by which time Queen Elizabeth I was on the throne. Around the same time as he completed this work, Baldwin is said to have assisted the Royal Master of Revels, George Ferrers, in preparing Christmas festivities at the Royal Court – this was an occasional role he would perform beside his work with Whitchurch. Baldwin’s last known work was The Funerals of King Edward the Sixth (1560). In 1563, he is believed to have been ordained a deacon and stepped away from the printing trade. He served in various clerical roles (there is an account of him preaching at Paul’s Cross) before dying some time prior to 1st November, 1563. (With thanks to John N King’s 2004 article in the Oxford Dictionary of National Biography).